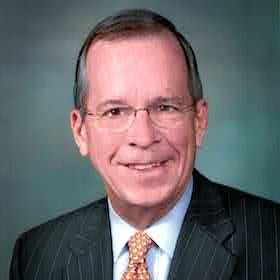 Admiral Mike Mullen served as the 17th Chairman of the Joint Chiefs of Staff (2007-2011). He was the principal military advisor to President George W. Bush and President Barack Obama. He led the military during a critical period of transition, overseeing the end of the combat mission in Iraq and the development of a new military strategy for Afghanistan. He advocated for the rapid development and fielding of innovative technologies, championed emerging and enduring international partnerships, and advanced new methods for combating terrorism — all of which directly culminated in the elimination of Usama bin Laden. As Joint Chiefs Chairman, he spearheaded the repeal of Don’t Ask, Don’t Tell. Admiral Mullen has deep experience in leading change in complex organizations, executive development and succession planning, diversity implementation, crisis management, strategic planning, budget policy, congressional relations, risk management, technical innovation, and cyber security. He is widely recognized as an “honest broker” in his key leadership roles as the trusted advisor to both President Bush and President Obama. He maintains strong relationships with leaders around the globe. He and his wife, Deborah, remain staunch advocates of veterans, their families and the families of the fallen on a broad range issues including drawing public attention and institutional focus to the challenges of post-traumatic stress, combat-related brain injury, military suicide, care of the wounded and veteran employment and homelessness. A native of Los Angeles, Mullen graduated from the U.S. Naval Academy in 1968. He commanded at every level in the Navy. His fleet experience culminated in his assignment as the Navy’s highest ranking officer, the 28th Chief of Naval Operations (2005-2007). Admiral Mullen earned a Masters of Science degree in Operations Research from the Naval Postgraduate School and completed the Advanced Management Program at the Harvard Business School. He is an adjunct Professor at the Woodrow Wilson School at Princeton and a member of the National Academy of Engineering. He is on the board of Directors for General Motors and Sprint.